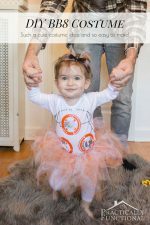 The full tutorial for making these adorable onesies is below, but if don’t want to make them yourself, I’ll make them for you! 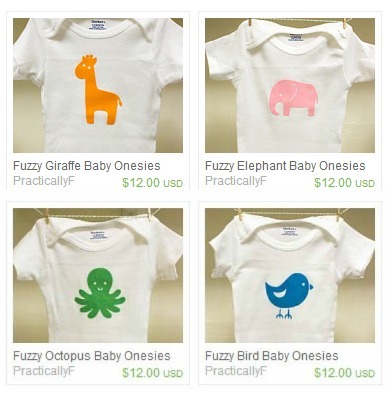 You can find these baby animal onesies in my Etsy shop here! 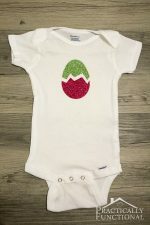 I love the idea of handmade gift for baby showers; baby stuff is super cute and easy to make, and the new mom will have an adorable handmade keepsake as well! 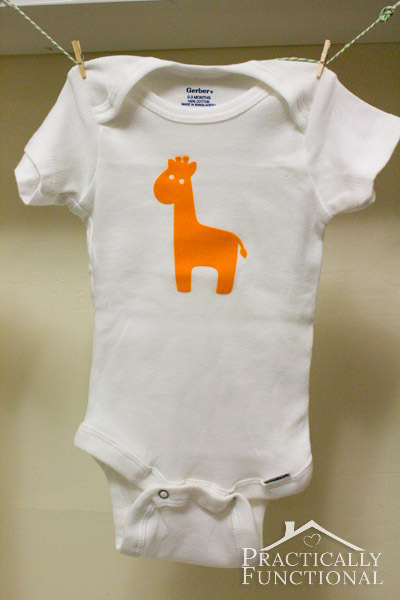 If you need a great baby shower gift idea, check out these adorable fuzzy baby animal onesies! They take about five minutes each to make, and they’re too cute, so they make a great gift for any new mom! Cute, right?! It’s a little hard to tell from the picture, but all of those baby animals are made of a flocked material, so not only are they adorable, but they’re fuzzy too! Last time the Silhouette store had a huge sale I bought four rolls of flocked heat transfer vinyl, so that’s what I used for this project. If this is your first time using heat transfer vinyl, check out my full tutorial on how to use heat transfer vinyl. 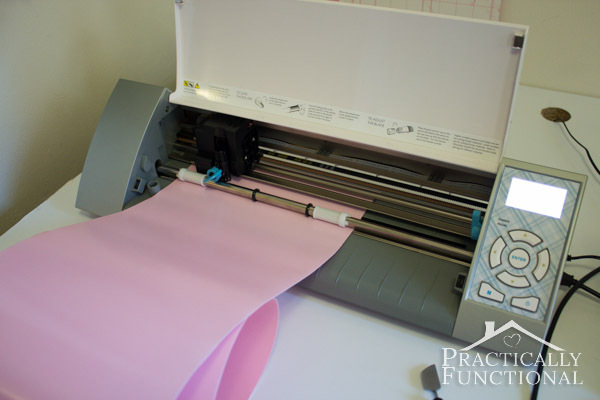 Heat transfer vinyl is a tiny bit tricky if you’ve never used it before, so the tutorial has specific instructions with pictures, and a bunch of tips and tricks for getting a perfect heat transfer project! 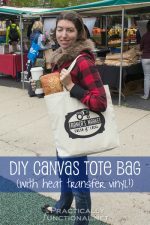 I’m not going to get into all the details again in this post, but when you cut heat transfer vinyl with your Cameo, you don’t need to use a cutting mat. Just load it right in! And remember, you need to cut a mirror image of how you want your finished project to look, so don’t forget to flip the text or graphic before you cut! 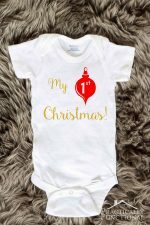 Once your design is cut, peel away the extra heat transfer vinyl, leaving the design you want transferred to the onesie on the plastic backing. 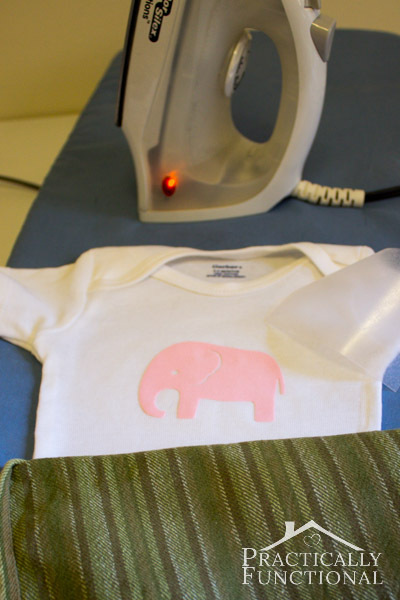 Position the design plastic side up on your onesie, lay a hand towel over the plastic to protect it from your iron, and press down with a hot iron for 45-60 seconds. Don’t move the iron side to side, just press! After about a minute lift up the iron and gently peel away the plastic backing. 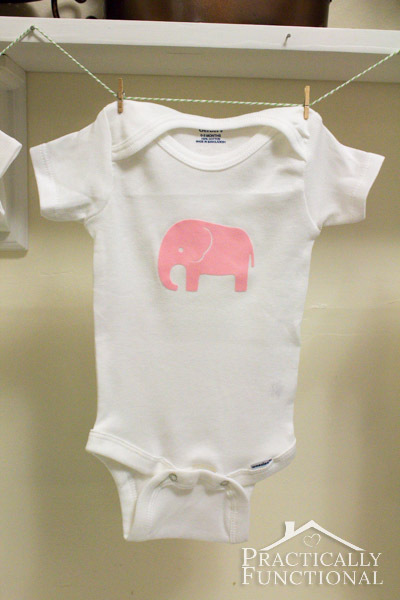 Your heat transfer vinyl should now be stuck to the onesie! I couldn’t stop at just one, plus I had four colors of flocked heat transfer material, so check out the others I made! They all turned out so cute! I need more of my friends to have babies so I can make more of these things! 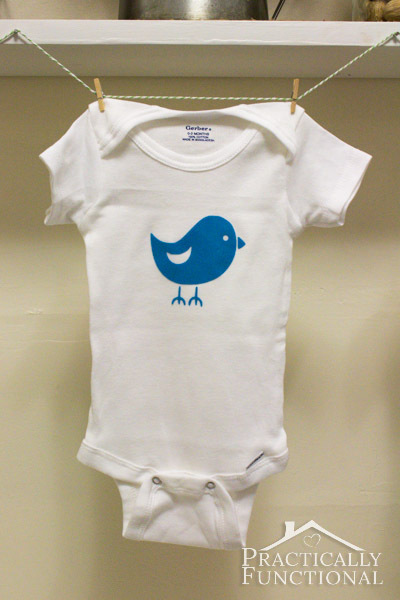 You can find these baby animal onesies in my Etsy shop here! 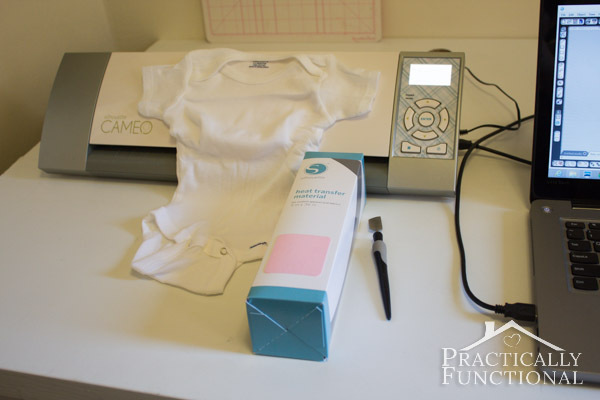 If you’re looking for other great handmade baby shower gift ideas, check these out! Okay, so these are so adorable!! I might just have to hop on over and order some heat transfer for myself :o) Thanks so much for hosting this AWESOME online shower. It’s absolutely perfect & I am so grateful to yall for celebrating our little ones. Aww, you’re so welcome! Happy Baby Shower!!! This is awesome! I saw these the other day in a round up and fell in love with them! I searched for a tutorial and had NO clue why you didn’t have one up yet! Oh my gosh thank you thank you thank you for helping host this shower! You ladies are unbelievable and I am beyond blessed to call you all friends! Thank you!!! Hehe, it was a sneak peek but I was saving it for today! Happy Baby Shower! Awww! Jessi, these little animals are so sweet! I have wanted a Silhouette FOR-E-VER! What a fun project to do at home. Thank You so much for the baby shower surprise! This is great checking out each of your sites today. I feel so blessed- I have the BEST blogging friends! I’m seriously in love with my Cameo (JM’s a little jealous :-p) and it’s perfect for stuff like this! I’m so glad you liked the shower, happy baby shower! 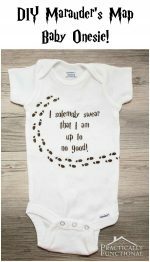 These little onsies are so super cute! That silhouette is super awesome, yo!!! Adorable! And so stylish too, might I add. 🙂 Thank you thank you thank you so much for helping put together this virtual shower for us! Your talent is just amazing! I hope I can find some time to make some of these before the baby comes along! You’re so welcome! And they’re real quick and easy, but I know you’ll probably be busy with more fun stuff like nursery decorating! 🙂 Happy baby shower! these are so incredibly cute! i can’t decide which one is my fave! Adorable!! I love the little octopus! Such a great gift idea Jessi! I love these! 🙂 Thanks for a great day yesterday! What fun! 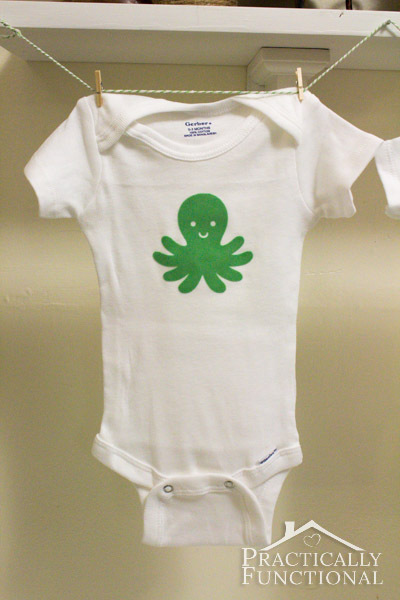 Oh I love this idea, but I also super crazy love, love, love that octopus onesie!!! They really did turn out SO cute! And I love the virtual baby shower idea. You’re always so creative! Have a wonderful weekend, friend! Those are so adorable!! I love the little animals!! They are adorable. I love them all – but I think the little octopus might just be my fave (with the giraffe a close second). what a sweet idea:) that’s what i love about blogging, the great community! Hi! I chose this as one of my top 3 picks from THE Pin-it party over at creative geekery! Thanks for linking up! Wow, thank you so much Michelle, I’m so honored! This is such a super cute idea! I love the idea of still being able to throw a friend a shower even if she is far away. 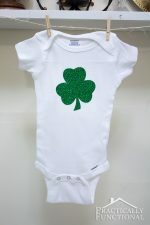 Love the onesies too. Thanks so much for linking up to the Pinworthy Projects Party!